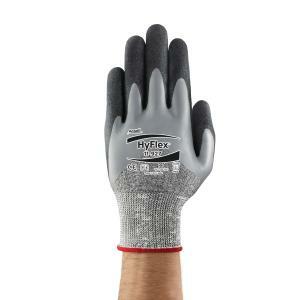 The first HyFlex® glove to combine advanced cut resistance, oil repellence and oil grip in a single flexible glove. Ideal for handling sharp metal components coated in oil or lubricant. Patented Ansell Grip™ technology uses microscopic channels to wick away oil & moisture from part surfaces and tools, providing industry-leading wet and oil grip for added safety and efficiency. The design combines a ¾ nitrile dip with grip. This ensures EN Level 4 abrasion protection and long-lasting EN Level 3 cut resistance. The ¾ dip geometry means extra protection against oil exposure and knuckle abrasion. A new former shape offers superior fit. Together with a highly flexible polymer and a wide range of sizes, this enables more agility in medium-duty applications. Greys and blacks mask dirt in oily, grimy and gritty environments.